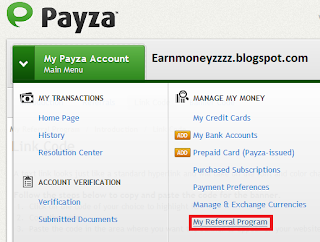 Payza.com is the most trusted online bank in the world which was Alertpay before.From business owners to webmasters and freelancers also online earners likes Payza for its trustworthy.But do you know that you can also earn some extra money with Payza.So today i will tell you how to earn money with Payza. Click on my menu on the top. Then click on My Referral Program. Then Choose hyperlink,banner or link code. Promote links on your website or social networking sites. You will earn money when someone signup and transact money. Its really very informative blog i read here as i like the way your represent your blog and am also going to share this blog with my friends. this msg is really helpful for us. So I took a video of myself getting paid $500 for participating in paid surveys.